Oh, oh, oh, these are soooo good. Who would have thought that garbanzo flour, water, salt and pepper, and a bit of olive oil could taste so rich? So buttery? This month, Lori of Lip Smacking Goodness chose chickpea (garbanzo) fries by Mark Bittman. 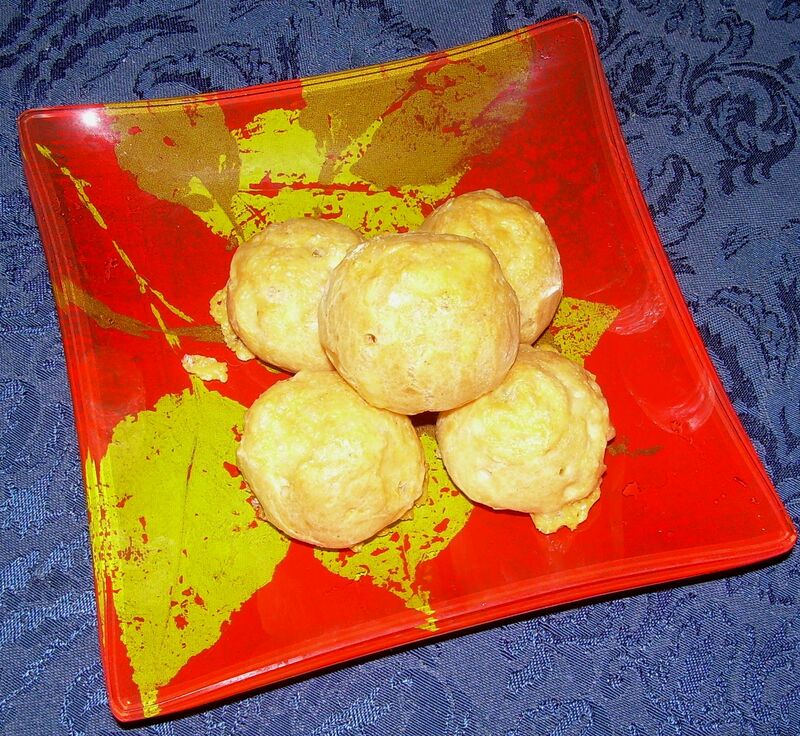 Ever since I saw a similar recipe in Michel Richard’s Happy in the Kitchen, I’ve been wanting to make them, and I was happy that Lori picked this quick and easy recipe for Recipes to Rival. You can find the original recipe at Lori’s blog. I cut the recipe in half, and then pan fried half of them in olive oil and baked the others. A light sprinkle of parmigiano reggiano, and I was good to go. Both versions were delicious; the fried ones were crispier, of course. The key to these, I think, is not to skimp on the salt. 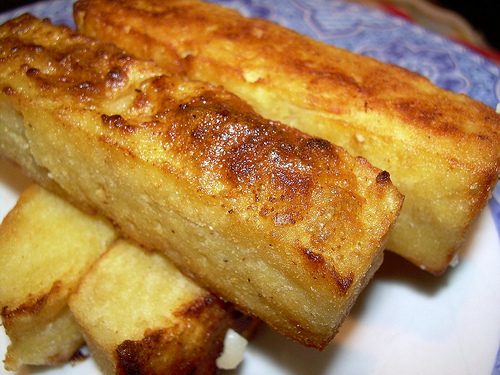 Think: polenta. If you don’t season it well, it never quite recovers. Ditto with these fries because, basically, they are a firm polenta made with garbanzo flour, not cornmeal. I loved these, and I encourage you to give them a try. Be sure to check out the R2R blogroll to see what the other group members have been up to, and join us next month when we are making my pick! Recipe after the jump. continue reading "R2R – Garbanzo Fries"
Yes, you. I’m talking to you, Chopped Liver! I saw Ina Garten make this on her show, Barefoot Contessa, a while back, and it was one of those recipes that intrigued me and just sort of percolated in the recesses of my brain. I watched a rerun of the same show, and this time I decided to make it. Master Chow usually likes meats with strong flavors, like lamb and venison, so I thought, “why not?” Well, this was a hit. He loves it, and when I take the lid of the container, the dogs go crazy. I took a little taste, and even I thought it was good! It tastes a lot like liverwurst. Some thoughts: First, use organic chicken livers, which I get at my local Whole Foods. The liver is the filter of the blood, and every hormone or drug given to an animal ends up there, so you want to get as clean and pure a source as possible. Second, if you keep kosher, have some chicken fat (schmaltz) on hand before you start. The original recipe calls for a cup of it, but I ended up using about 5 Tablespoons of clarified butter. Third, cleaning the liver can be rather time consuming and messy. 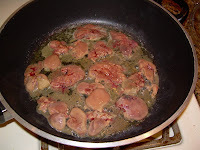 Fourth, do not overcook the livers – they should be a pale pink inside. Finally, this spatters a lot when you’re frying the livers, so cover up and move anything out of the way that you don’t want to get covered in grease. Drain the livers and saute them in 2 batches in 2 tablespoons of the butter over medium-high heat, turning once, for about 5 minutes, or until just barely pink inside. Don’t overcook the livers or they will be dry. Transfer them to a large bowl. In the same pan, saute the onions in 3 tablespoons of the butter over medium-high heat for about 10 minutes, or until browned. Add the Madeira and deglaze the pan, scraping the sides, for about 15 seconds. Pour into the bowl with the livers. Add the eggs, parsley, thyme, salt, black pepper, and cayenne. Toss quickly to combine. Transfer half the mixture to the bowl of a food processor fitted with a steel blade. Pulse 6 to 8 times, until coarsely chopped. Repeat with the remaining mixture. Season, to taste, and chill. Serve on crackers or matzo. Oh, how I love CPK’s hummus! Creamy, smooth, rich – I couldn’t figure out why I liked their hummus so much more than others. After I happily purchased California Pizza Kitchen Pasta, Salads, Soups, And Sides , I discovered their secret: they use cannellini beans, not garbanzos! Eureka! I adapted the recipe just a bit. This makes a generous amount of hummus – I would say more than enough as an appetizer for six to eight people. In a food processor, process the beans and pulse the machine a few times to chop them coarsely. Add the garlic clove and process them until finely minced. With the machine running, puree the mixture slowly pouring the sesame paste through the feed tube. Still with the motor running, pour the olive oil, lemon juice, and soy sauce through the feed tube, stopping the processor occasionally to scrape down the sides of the bowl. Stop the processor, open the lid, and add the salt, cumin, coriander, and cayenne. Process until thoroughly blended. If the puree seems too thick, pulse in the 1/4 cup cold water (or more, if needed, to reach the consistency that you are looking for). Transfer the puree to a bowl, cover with plastic wrap, and refrigerate to chill well before serving. In a bowl, combine the Checca ingredients, mixing them thoroughly. Cover with plastic wrap and refrigerate. About thirty minutes before you plan to serve it, place the chilled hummus in a bowl and arrange the tomato Checca on top. 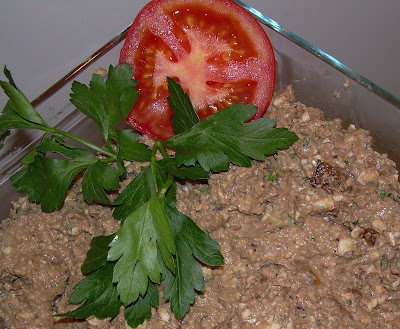 Garnish with the chopped parsley and surround with pita triangles or crackers. This recipe is easy and oh-so-tasty. 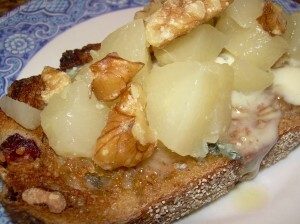 I can’t tell you how many candied nut recipes I tried before I settled on this adaptation a few years ago. I found it originally on an internet bulletin board. What I discovered during a lengthy experimentation process is twofold: (1) a complicated recipe, and/or (2) many ingredients do NOT make a better candied nut. I’ve fried them, sauteed them, baked them. I’ve used recipes with as many as seven or eight spices. Some of the results were literally indedible, and I was forced to throw the whole batch of nuts out. An expensive experiment! People love these nuts, and often ask me for the recipe. So here it is, Easy and Tasty Candied Pecans! Preheat oven to 250 degrees F. Grease rimmed baking sheet with butter (optional). Place nuts in a large mixing bowl. In a separate bowl, mix dry ingredients thoroughly. In a small bowl, beat egg white with water until thick and foamy. Pour egg white mixture over nuts and toss them with your hands until they are thoroughly coated. Add sugar mixture and mix well. Spread nuts on baking sheet and bake for one hour. Turn nuts once after about thirty minutes. Notes: feel free to add another spice, such as cardamom or allspice, but keep it simple. The last few months have been a whirlwind of activity. Despite my best intentions to post on this blog, “Life” happened! At any rate, one of my modest goals for 2007 is to update this blog on a more regular basis. The recipe comes from Paula Dean. It is an incredibly easy appetizer, and absolutely delicious. Master Chow despises macadamia nuts, and he loved this. Just be sure to get a fairly firm regular brie (I accidentally made this with a pepper brie once, and it was not good!). Paula Dean serves this with crackers and apples, but I serve it with plain water crackers, or with a mild salami to cut some of the sweetness. Also, you may have to play around with your oven temperature, as well, to get the desired consistency. Don’t be afraid to experiment! Before you make this, set the brie out so that it comes to room temperature. Preheat oven to 350 degrees. Place the brie on an ovenproof platter or pie plate. Spread with the brown sugar mixture. Bake for 15-20 minutes or until the brie is softened, and the sugar melts, bubbles, and turns a light golden brown. Place crackers around the brie and serve immediately. I recently made this for a birthday party – it was well liked by all, including Master Chow, who is not a big fan of salmon. I didn’t have the prepared horseradish, so I used the prepared wasabi that comes in those little packets that you get with sushi. The first time you make this, don’t be tempted to leave out the horseradish; the amount is so small that you don’t get any heat, but it definitely adds depth to the spread. I’ve also substituted low fat sour cream, with no decrease in quality. 1/4 pound (4 ounces) smoked salmon, mincedCream the cheese in an electric mixer fitted with a paddle attachment until just smooth. Add the sour cream, lemon juice, dill, horseradish, salt, and pepper, and mix. Add the smoked salmon and mix well. Chill and serve with crudites,crackers, or crostini.